My Copy: I received a paperback copy of this novel from the author in exchange for an honest review. 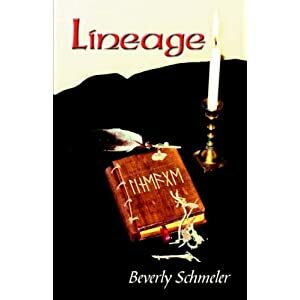 Review: Beverly Schmeler will have you eating out of the palm of her hands with her novel Lineage! It is an addictive interesting read and I'm so surprised I couldn't put it down. From the very first pages of Lineage I was aching to read more. I read a previous novel of the authors Malory's Treasure and I didn't think her books could get any better as it was simply amazing! Thanks so much to the author for sending me a copy of her novels! What do you think of the review? Do you like the sound of Lineage? Thank you so much Kerry-Ann. I posted it on Facebook. Your words have lifted me higher as they say :) xoxo All the best to you and Merry Christmas and Happy New Year.